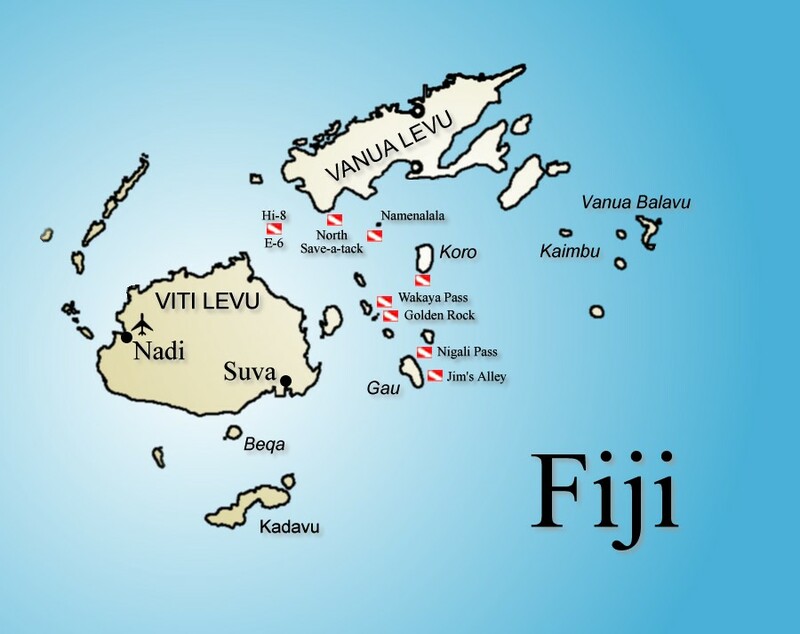 See our guide to the best dive sites in Fiji courtesy of Dancer Fleet and Aggressor Liveaboards. Jim's Alley consists of 3 large bommies that start at about 15 feet from the surface and drop to the floor at about 60 to 70 feet. The bommies are covered in soft and hard corals, sea fans, whips and anemones. This sight also frequently has white tips, turtles, barracudas and an occasional ray. Ningali Pass is a small cut in the reef that can only be dove 1 1/2 hours before low water to 1 1/2 hours after low water, otherwise the visibility is poor and the current can exceed 4 knots. At this sight we see large grouper/jew fish, barracuda, big eyed jacks, snapper, big gray reef sharks and an occasional sea snake. We also have seen eagle rays, mantas and hammerhead sharks. Black Rock Caverns, in the mouth of Dere Bay and the host of many swim-throughs, caverns and caves. This is also one of our favorite night dive sights that is the host to large file fish, many decorator crab, white tips, flashlight fish, eels and occasionally squid. This site also has a large school of barracuda. It is in the lee of the island of Koro and can be dove most any time during the year but visibility is usually limited to 60 feet. Koro Gardens is marked by a single large bommie that comes to within 15 feet of the surface. The area around the bommie is about 45 feet to the bottom and drops off to 95 feet in some areas. Hard corals cover everything while an abundance of reef fish crowd the waters and make the diving spectacular. Shark Fin Point is on the north east point of Koro Island can be action central. On most dives you will see a large school of about 500 barracudas, eagle rays, many white tip, lots of grey reefs, lobster, eels, and we have even seen whale shark here, yes we really have. Not only are the fish and shark abundant but it's covered in both hard and soft corals. When the tide is running this can be a most enjoyable drift dive because little effort is needed to move and its seems as if the show just swims by you. At the turn of the century Makongi Island was the home of the last leper colony in Fiji but today its the home of the Fijian turtle and clam farm. The north end of the island is protected by a barrier reef which has a lot of great dive sights. The foremost popular are White rock, Rustic arch, coral garden and Makongi channel. Each of these sights has wide variety of bright indigenous little fishCoral Gardens is a series of bommies that have a beautiful supply of hard and soft corals. This sight also has turtles, white tips sharks, moray eels, lion fish and once in a while a nurse shark. Visibility can sometimes be below 40 feet because of heavy plankton. Pacific. Included at both sights are sweet lips, hammer heads, white tips, occasional silver tips and if we're lucky a whale. Makongi Channel is most often a drift dive due to the fact its at an entrance to the inner reef. On an incoming tide the visibility is quite good and sometimes exceeds 100 feet. The usual party of Makongi sea life abounds here in the channel as well. Rustic Arch was discovered by photo pro Rusty Madsen during an exploration trip in Feb. 98. This sight has excellent hard and soft corals, sea fans, sea anemones, lion fish, moray eels, white tips and a recently discovered home to a large Napoleon wrasse. White Rock is at the entrance of Makongi channel and aptly called because the waves always break on it causing the reef to have a white cap. This sight has white tips, occasionally eagle rays and mantas, eels, large file fish, an abundance of hard and soft corals but most of all it has the friendliest school of fuseliers. The Namena barrier reef stretches a distance of over 10 miles. There is an abundance of dive sights here but many are unprotected in open waters and can't be dove in bad weather. Most of these sites have the possibility of high currents and as a result the sea life here is abundant and very active. It is not uncommon to see gray reefs, white tips, silver tips, barracuda and dog tooth tuna on a 30 minute dive. The following are the most popular dive sights. Chimneys is three slender bommies which start at about 74 feet and come to within 10 feet of the surface. On the sandy bottom you'll find a field of garden eels with gobies and shrimp scattered throughout. Everywhere in the bommies of this site you can find pipe fish, cleaner fish, nudibranches, soft corals, hard corals, sea anemones with clown fish, and free swimming in the current above the bommies are unicorn fish and anthiest. Between the bommies in midwater are resident barracudas and it's not uncommon to see white tips or grey reefs. Magic Mound is a single bommie 80 to 100 feet long and 30 to 40 feet wide. It starts at 80 feet on one side and comes up to within 15 feet of the surface. Its covered in hard corals, soft corals, sea anemones, sea fans and lots of lionfish lurking in between or hanging around under ledges. This sight is also known for its white tips and grey reef action. North Save-a-Tack is on an incoming tide where the action is fast and furious. A diver must descend to a depth of 70 feet in water that often has a visibility of over 150 feet. On the bottom a diver may see grey reefs, white tips, barracudas and dog tooth tuna with an occasional silver tip without even moving. The current is strong and during an incoming tide and the visibility is excellent. Divers normally start on the east side of North Save-a-tack and end their dive on the west side among the hard and soft coral covered bommies. This side is excellent for macro and wide angle shots. Gem Stone is on the outside edge of Wakaya passage. This is a wall dive with swim throughs, hard and soft corals and as one guests who has dove around the world said, this sight is as good as they have in the Red Sea. Mantas also frequently visit this location along with hammer head and white tips sharks. When diving this location on a night dive the light fish here are very abundant and make for a great light show. Golden Rock is a bommie that starts at 35 ft. on the high inside edge it then comes up to 10 ft. and is 20 ft. across. This site has soft coral, hard coral, cleaner shrimp, blue ribbon eels, lionfish, and most important it is a cleaning station for mantas and we see mantas here 90% of the time.Sand Point is a wall dive between the island of Wakaya and Mokongi. On this dive we frequently see mantas, eagles rays, turtles, white tips and the various colorful fish of the South Pacific in abundance along with hard and soft corals. Wakaya Pass starts at about 35 ft. sandy bottom then you swim out over a wall and turn to the left. As you come over the drop off of the wall you can look straight down to about 140 ft. While swimming along the wall you may see blue ribbon eels, White tip, Nurse, and Hammerhead sharks along with Mantas, Marble Rays, Turtles, Eagle rays and Barracudas. Along the wall you may see blue ribbon eels, White tip, Nurse, and Hammerhead sharks along with Mantas, Marble Rays, Turtles, Eagle rays and Barracudas.